Being from New England, I have enjoyed a gathering or two on the beaches of Cape Cod and the coast of Maine with a roaring fire and then clams, corn, sausage, old bay seasoning and potatoes steaming and roasting on the coals. There is nothing quite like eating on the beach with a warm summer wind gently blowing your hair and the napkins on your plate as you enjoy a late night meal. I’m not sure the traditional Portuguese clam boil was accompanied by beer and wine coolers, and a clam boil of mine wouldn’t either, but that is what the hosts provided 30 years ago. It’s much harder to legally have a fire on the beach these days, but I wanted to try to re-create the recipe in the kitchen, this time with shrimp instead of clams and a sheet pan and the oven instead of a fire on the beach. 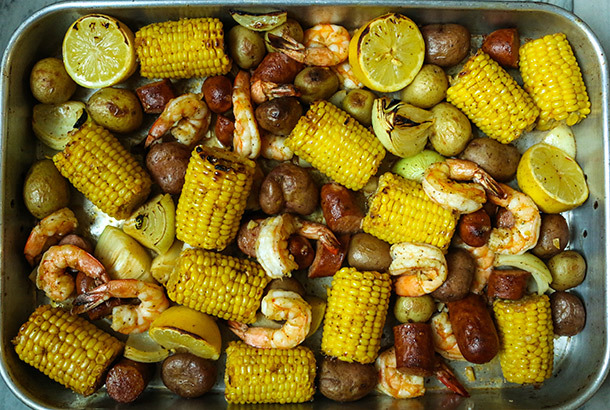 It isn’t hard to make a Mediterranean Sheet Pan Shrimp Boil and it only takes a few steps. If you do it right you can have the whole meal done in 30 minutes. 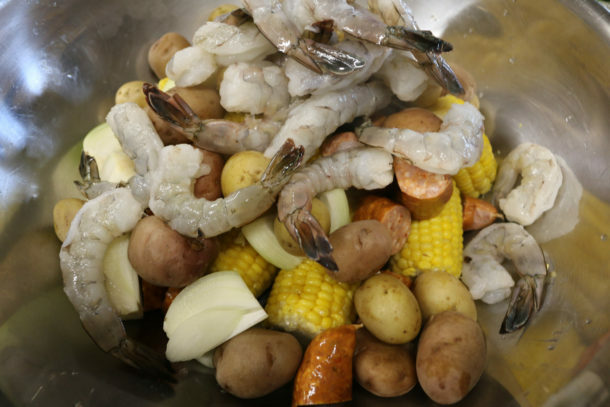 Tips to making a Mediterranean Sheet Pan Shrimp Boil in 30 minutes. Gather all your ingredients and wash your vegetables. Start the potatoes cooking right away, adding them to the cold water as it heats up. Prepare everything else as the potatoes cook. 4. Melt the butter with the olive oil, garlic and Old Bay Seasoning. 5. Add the corn to the potatoes in the last few minutes of cooking. 6. 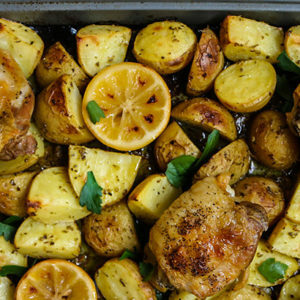 Drain the potatoes and corn and then mix in with the rest of the ingredients and then pour everything into the sheet pan and then immediately put sheet pan in the oven. A Mediterranean Sheet Pan Shrimp Boil is a meal in itself, but I like to add some traditional and non-traditional side dishes. The two most traditional accompaniments would be cornbread and coleslaw. Here is our Savory Skillet Cornbread recipe and Anne Burrell’s Red Cabbage Slaw. 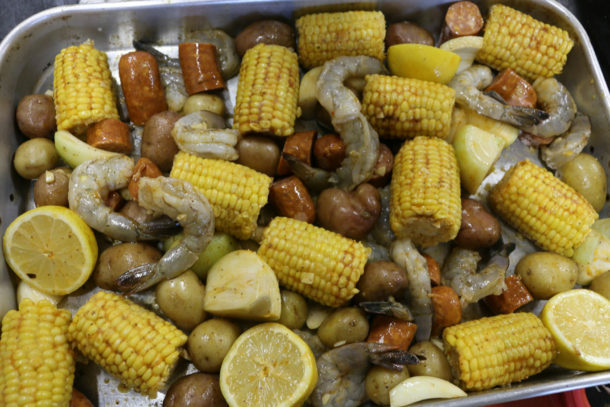 I also like to serve a few vegetables with the Mediterranean Sheet Pan Shrimp Boil. Something easy and light like Lemony Asparagus with Garlic or Sautéed Swiss Chard with Garlic are two of my favorites. Finally, a nice light fruit salad, sorbet or an olive oil based cake end the meal off nicely. Brittany Nickerson’s Rosemary Olive Oil Teacakes are one of my favorite desserts to go with shrimp boil. Add potatoes to a saucepan and cover with water. Bring to a boil. Low boil potatoes until they are almost fork tender (about 10 minutes). Continue with vegetable prep as potatoes are cooking. While potatoes are cooking, prepare other ingredients. 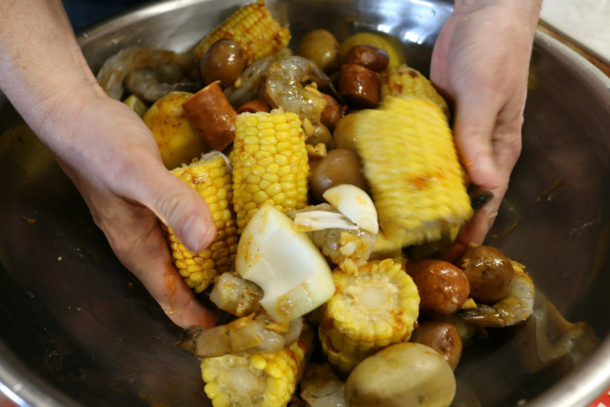 Cut each corn on the cob into thirds (add to cooking potatoes near end of cooking, cut each onion into quarters, press garlic cloves through a garlic press, chop parsley, halve lemons, peel and de-vein shrimp (keeping tails) and cut sausage into 2" pieces. In a small saucepan, melt butter on low heat, then add olive oil until heated. 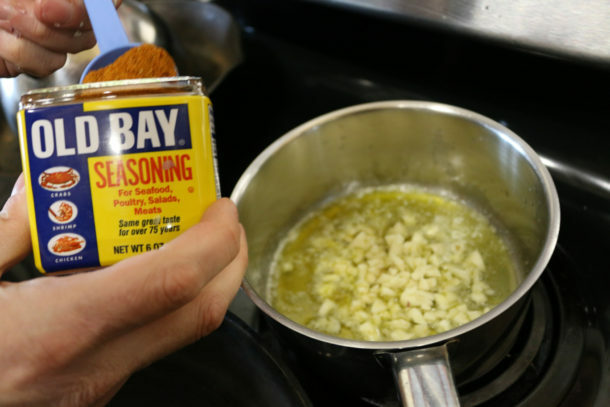 Stir in Old Bay Seasoning and garlic. Turn off heat. In a large bowl add drained potatoes and corn, shrimp, sausage, onions, garlic, lemons, and butter/olive oil blend (everything except parsley). Mix well so everything is coated with oil and seasoning. 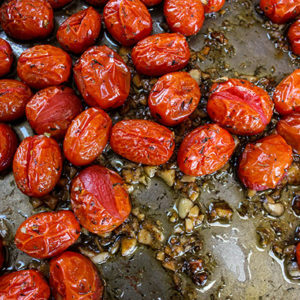 Pour bowl of ingredients onto a sheet pan. Spread out to make a single layer (or as close to a single layer as you can). Bake in oven until shrimp are opaque (10-15 minutes). 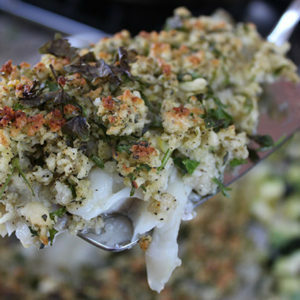 Remove from oven, garnish with chopped parsley and serve.